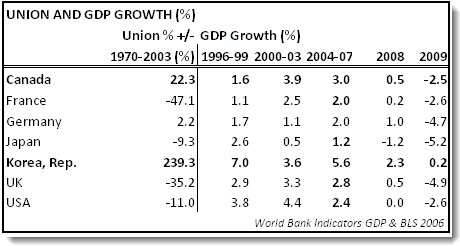 Only Canada and Korea, in particular, showed growth in union membership since the 1970s. France and the United Kingdom saw substantial losses. Unions contracted at a slower rate in Japan and the United States. The impact was the same, loss of political influence for the union movement. "It's been three years since the financial crisis hit the globe.…the most vulnerable members of the society including women, youth and the elderly as well as precarious workers whose number has been soaring due to the increased labour market flexibility are suffering from severe employment insecurity. Social polarization has been further deepened by the increasing number of working poor and widening income disparity. I was surprised to hear of the strong union sentiment in Korea and especially surprised to hear of their anti-"globalization" philosophy. I have not closely followed the Korean export success but hasn't the country had very rapid export growth? Are they doing it (in addition to whatever work and education ethic) in the Japanese and Chinese manner - ie manipulating their currency? In fact aren't they even a huge threat to Japanese exporters - and especially because of more competitive pricing? Both unions oppose current trends in globalization. KFTU issued the following solidarity message to unions around the world in March 2001:.......ie should be March 2010 (and so is very recent sentiment)? "We are looking hard at how we work in the nation’s political arena. We have listened hard, and what workers want is an independent labor movement that builds the power of working people -- in the workplace and in political life … Our role is not to build the power of a political party or a candidate. It is to improve the lives of working families and strengthen our country. What's -- Or Who's -- Their Backup Plan? Do you see this as being more than a reminder from the unions that they have a quid pro quo relationship with the Democrats and they won't provide the quid without the quo? I guess maybe he's saying that to appease his membership. Other than that, because of our long history of two party politics, he's possibly committing his members to doing nothing in 2012. Given the Republican turn to the right -- which the Tea Party influence has only intensified (at least while running, if not in office), the Democrats are all organized labor has right now. Is there some Column C person out there I don't know about who might run this time from the left? I wish there were, but who? P.S. I have to admit that I find his claims to speak for all workers grating. Sometimes what the unions do helps all workers, but often it's for themselves only. I feel he's using all workers to hide behind while advocating his positions, he never refers to his "members" at all, only "workers." While this "Koch brothers" anti-union rhetoric is completely off the rail on unions, the history is they do help working conditions, wages and professionals really need one, it seems also unions have gone off the mark too. Then, the teachers union. The rules to become a teacher these days are inane, but the entire educational system seems really screwed up. It isn't the teacher's fault, it's more the system and those administrators, still I don't think they are helping. On the other hand, H-1B visas are being used to displace teachers. It's ridiculous, here are all of these people needing a job and they are importing foreign guest workers as teachers. So, while ranting nonsense trying to claim unions haven't helped worker, esp. with wages is false, some of the original criticisms have good points. The damn unions seemed to be more interested in pushing "amnesty" and illegal immigrant causes that getting more Americans in the unions and increasing wages, securing jobs. Your observation on the Korean government policy is consistent with the storyline on the Tiger nations. That is why is is all the more interesting to find both union federations attacking globalism and the G20. The 2011 KFTU criticism of "the increased labour market flexibility" and those "suffering from severe employment insecurity" is striking. KCTU is also adamantly anti globalism. Those are the correct criticisms from US worker perspectives imho. Hopefully, we're looking a a more international movement against the phoney austerity programs. Thanks for the tip on 2011. As Roseannadana said, "It's always something." But, in reality, my father was correct - "A job once well done is twice done." incl with Roseannadana (and your Dad) - but also re the phony austerity push (already a painful failure in Europe). Unfortunately even Krugman is depressed per his blog yesterday - after appearing on This Week - he was the only one pushing against the austerity BS. Good to see a strong union environment in Korea and hopefully strong pushback against phony "Free Trade" and Globalization (at least as purchased and practiced by the "masters of the boardrooms". From taking the temperature, beyond the Koch brothers and others in their never ending relenting media campaign against Unions, with their bought and paid for representatives, I see a real problem with the unions in pushing for "amnesty" and that includes rank and file union members. People see, every day, teenagers not being able to get that summer job, because the job has been taken by illegal immigrants. People working at Walmart, not making enough for rent see illegals getting jobs at food processing plants, at canneries and probably the most dominant, meat packing plants and they are pissed off because they need those jobs. A meat packer used to pull in about $20 an hour, now it's minimum wage, benefits slashed and use of illegal labor to achieve that labor arbitrage. Construction jobs, which are decimated as it is by the housing bubble collapse, is also a place where union jobs would pull in a living wage and now these same places pick up "day labor", usually illegal, and pay cash, $8-$12 and hour, no job security, no workman's comp., no nothing. So, Democrats, literally build "day labor centers", which they are clear violations of U.S. labor law, per the demands of special interests. These positions, probably most of all, super piss regular people off and have turned them off to unions generally. They see unions as representing everybody but them and most of all illegal immigrants and they also seem them as just protecting their own cushy jobs, instead of looking to improve working conditions for all. Ripe for some special interests to swoop down and claim "unions are bad guys", which is what's happening. Have Unions Given Up on Americans? This would be a perfect time to harness worker anxiety and discontent and change a lot of workers from anti to pro union. It might not be a good time to unionize -- people might be too scared to annoy employers -- but seeds planted for the future would surely grow well. Many of the people still in unions are in the public sector. Have private sector unions given up? Just as a matter of resource allocation, their efforts for immigrants seem excessive, since I don't think many illegal immigrants are public service union members. Unfortunately I think amnesty and continued high levels of legal immigration -- an open borders philosophy by default, because there are objections to every kind of immigration restriction -- has become a knee jerk progressive cause. What kills me is that when people in government talk about consulting with "labor" it still means labor union leaders. At the very least, the worker bees of America need a large umbrella advocacy organization like AARP -- or even the low key AAA. Such a group would have to be attractive to even people who don't like unions, so I suppose it would avoid many issues. But it would have lots of members, and in numbers there is strength. Anything would be better than to be voiceless and helpless, like we are now. First, unions do not guarantee jobs. Secondly, high union wages and union benefits will only serve to increase the cost of products and services. And, thirdly, unions will push businesses to either "job out-sourcing", or relocating outside of our borders. Also, union made products open the doors for more cheap foreign imports. The examples to back-up the above statements are the textile, steel, electronics, furniture, automotive, and other industries that were once the backbones of "industrial America". The truth is, even without unions, we still can't compete with cheap foreign labor markets. So, how does anyone expect us to compete in a global economy with high union wages and fat union benefits jack'in up the cost of goods and services? Also, with the majority of our workforce working for less wages and benefits than it did ten years ago, who will be able to afford union made products and union services? Retail giants like Wal-Mart would love to see union made products become the norm in this country. Unless everyone worked for a union, and made tons of money, the Wal-Marts would greatly prosper from the non-union shopppers. Only union workers can afford union made products. Everyone else has to buy cheap foreign imports. Unions had a place in the first half of the twentieth century, but they have long since served their purpose. At present, we have labor laws that protect workers. We have OSHA and the EPA that protect workers. Employers pay workman's comp insurance that protect workers. In today's workplace, unions and union workers are all about "greed", and nothing else. Everyone wants to make a $$million bucks a year sweeping the floor and emptying the trash can. I have never been a union member and I don't like the union shenanigans that go on, either. However, your anti-union labor feelings seem to me to be anti-worker as well. You admit that employers are doing terrible things these days, shipping jobs out of the country and lowering wages left and right. You seem to think that correct response to this is for workers to accept whatever employers dish out and try to get by with cheap imports at Walmart. In the meantime, the labor exploiters are free to continue to do whatever they want. Why should American workers accept a life of anxiety, low wages and overwork because their boss wants 10 workers to do what 15 used to do? If we continue in the American worker death spiral, you know, there will be no more money for entitlements for the retired as we know it today. The cuts that would be necessary would be far worse than anything suggested by the Republican budget cutters. If the average American's wage is cut by half, their payroll contributions to Social Security and Medicare will go down by half too. We can't have a First World economy, with First World entitlements, if most people are making $10 an hour. The math doesn't add up. I'd rather see people fight to keep America a First World country for all of its people, rather than turn into a Mexico of the North. Even though I fully understand your comment, I fail to understand why you would think that I'm anti-worker. In reality, I'm the most PRO-WORKER person that you'll ever find, anywhere. I have been screaming about the harm meted out to the American worker for many years now. I preach pro-worker almost every single day. I have written about "American worker" disadvantages and backward progress on many many internet sites and many many internet forums. Obviously, you don't know me very well. Yes, I am anti-union. I can find absolutely no reasons to justify unions and union activities. But, "IF" businesses will allow unions to come in and dictate wages and benefits, then businesses deserve what they get. Many American manufactures have closed their doors because they could no longer pay high union wages and benefits, and remain competitive. One example would be the textile mills that closed due to cheap foreign imports. Businesses allow unions to come in, then find that they can't be competitive, and close their doors. Who wins? Our foreign exporters win. We can't have it both ways. We can't force employers to pay high wages and benefits, and remain competitive, and keep America working. The only way that we can force employers to pay high wages and benefits and keep America working, is to allow America to produce what America uses and consumes. Otherwise, cheap foreign imports will continue to shut the doors to American businesses, and force employers to out-source our jobs to foreign labor markets. 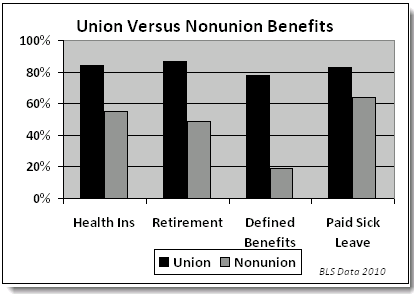 Also, union products and services are more expensive than non-union products and services. That doesn't mean that those products and services are a higher quality than non-union products and services. So, which products are more likely to be purchased by the average shopper? Shoppers have proven that they'll buy the least expensive products and services. An example would be the tremendous growth of Wal-Mart over the past thirty years. How many shoppers would buy at Wal-Mart "IF" every product on the shelves were made by American union workers? How does anyone expect us to be competitive "IF" what we produce has a high price tag comparatively? "IF" our general population can't afford union made goods and services, what leads anyone to believe that those folks in countries that we export to, can afford them? Where is the market for high cost union made goods and services? Yes, I wish that it were possible for EVERY American worker to make $150,000 a year, and live happily ever after. Yes, I AM PRO-AMERICA, PRO-WORKER, PRO-JUSTICE, and PRO-AMERICAN prosperity. I have preached it for a long long time now. But, I have also been blessed with good ol' common sense. I know that given the mentality, thoughts, actions, and paths taken by our anti-America government, that at present, there's little or no market for American "union made" products and services. Our unfair, unjust, and one-sided foreign trade agreements and policies allow cheap foreign made products to flood our markets. Thus pushing American made goods off the shelves. How many products can you find on retail shelves labeled "Made In America"? And, how many of those products are competitively priced and affordable to the general public? In reality, the high cost of union labor in America has sent many many American jobs to foreign countries. If that were not so, we would still have many of our plants and factories open and running three shifts a day. But, the United States government has created a situation that is steadily pushing us closer to third world status. American unions can not compete with cheap foreign labor markets. Again, I am very much PRO-WORKER, and very much PRO-AMERICA. You are talking as though every factory worker in America used to belong to the UAW. Not true. The big wage and benefits auto workers and construction workers received were never typical. Also where are all the strikes and walkouts you describe? They just don't happen all that often anymore. Personally, with all the illegal workers used to shield companies from worker complaints (example: meat packing), my guess is they probably should happen more often than they do. -"The membership of the United Auto Workers union has fallen to around 400000, down from a peak of 1.5 million in 1979." -"At America's union peak in the 1950s, union membership was lower in the United States than in most comparable countries." -"In 2006, there were only 20 major work stoppages (involving 1,000 or more workers), compared to the 1970s, when more than 200 strikes occurred each year. The number of union members involved in each strike has declined as well: in the 1970s more than 1 million workers participated in strikes each year, whereas in 2006 the number had fallen to only 70,000." -"Average hourly compensation including benefits was $35.69 for union members and $24.79 for non-union members in the second quarter of 2007." So while the union workers do make more -- and the public service unions sure get wonderful benefits (and would agree that their pensions in many cases are more than taxpayers can and should pay for) -- you can see that American workers get paid lots more than in China. We have got to find a way to run our economy so that we can sustain First World wages. If that involves tariffs and protectionism, I don't care. I don't think unions were the main reason companies went overseas. It was the cheap labor and pressure from Wall St. to keep earnings high and expenses low. It wasn't unions who forced companies to fire so many people and work the remaining staff harder, so that now "American companies are holding $1.9 trillion in cash, a record." Years ago, maybe 35 years ago, my brother and brother-in-law were out of work several times in a three to four year period. They both worked for the glass union in Montgomery, Alabama. Their union went on strike for months at a time. They had to travel hundreds of miles away from home to find work during the strikes. The union never paid their mortgages, car payments, utilities, groceries, or anything else. But, the greedy unions expected their union dues to be paid each month. I have seen many union strikes in my lifetime. I have worked in thirteen different states during my forty plus years as a member of America's workforce. I have seen plants and factories closed down because they couldn't pay union wages and benefits, and remain competitive. I have seen union construction workers ( in Arizona ) that were paid big time bucks for doing almost nothing in an eight hour day, day after day, after day. I have heard union workers brag about how much they make for doing almost nothing. At the same time, I've seen union workers retire with unreal benefits and pension plans. What did they actually contribute to our economy that non-union workers didn't? Are non-union workers a lower class of citizen? Do not non-union workers contribute to our economy? What is it about belonging to, and working for a union, that makes one special? I've never worked for a union, but worked very very hard at whatever job I was employed to do. Does that make me less of an American? I have turned down several union jobs because I saw no benefit in a membership. While it's true that I would've made way more money, I couldn't see doing something like that to my fellow Americans, my town, or my community. I didn't want to have a hand in sending my neighbor's job over seas. Yes, union membership has declined greatly. which brings me to this question: "IF" unions are so good, and so good for our economy, and this country, why are they in decline? Does it make sense that with all that pro-union folks say about them, that they would be steadily in decline? Where's the problem that unions can't gain membership and spread like wild fire? Why are workers not standing in long lines to join unions? And, where's the benefits to our economy, to our businesses, and to this country in general? Why not just force every single business in America to pay every employee $150,000 a year plus a fat pension plan? That way we wouldn't have a need for unions, right? But, "IF" we did that, who would buy the very expensive goods and services produced by union workers? Could we export them to poor third world countries? Would China or India buy them? Who could afford American made products if they were produced with expensive union labor? In reality, we're having a very hard time selling non-union made goods to other countries. Our living standards do not allow us to produce goods as cheaply as other countries. Now, If we add union wages and benefits to the cost of our products, do we not limit ourselves to a select market? Unions would be great for everyone "IF" America produced what America used and consumed. That way, Americans would be buying what they made themselves. Cash would then be circulating within our own economy, and not outside of our economy, as it is now. We do not have a positive cash flow within our economy. Americans are buying cheap foreign imports. Most Americans can't afford to buy American, especially American union made products. Again, where's the market for union made goods and services? Who would unions sell their high dollar goods to? I am not against workers making a living wage. I preach daily about the need for adequate living wage jobs. But, I am totally against work stoppage threats to intimidate employers to pay more than the job is worth and reasonable to them. Besides, if an employee doesn't like the pay and benefits a company offers, that employee is free to go look for work elsewhere. We do not have worker ownership or slave labor in this country. We don't employ child labor, and force employees to work in sweat shops. Our economy, and the global economy, which has dictated labor for some time now, can not take the weight of high union wages and union benefits. It jacks the price of goods and services out-of-reach for many Americans, and those that we export our goods to. Can we make tee shirts, bed sheets, and bath towels that will be competitive with those now made in China? Go check some prices and see the difference. Our standard of living has almost priced American made goods right out of world markets. In order to correct this injustice and economic killing situation, we must demand fair, equal, and balanced foreign trade. This will allow America to produce what America uses and consumes, and create fair competition for American workers, which will then drive wages up. A postive cash flow within our economy will produce the exact results unions hope to get. When you have a demand for good employees, wages go up. At present, there're way more workers than jobs, and wages are down. It's an employer's market right now. Unions can not solve our multitude of economic woes. But, fair, equal, and balanced foreign trade can go a long long way in accomplishing a living wage standard, as well as tax revenue and other economic concerns. They've "long since served their purpose." What purpose was that: to get decent wages; bring benefits to the workplace that many non union workers realized. Have we lost a need for that? Unions served their purpose so well, they were coopted. You say "unions and union workers are all about 'greed'." What do you know about it? Are you going to start talking about "welfare Cadillacs" next. That's a broad statement without any factual basis. It's an appeal to knee jerk bigotry. In this case, the slur is against an entire class of workers. It's really no different in structure and generalization than ethnic and religious slurs. And you confirm my point above: "everyone wants to make a $$million...sweeping the floor." That's a cheap shot, another over generalization, and a prime example of the rhetoric that was used to trash unions over the decades. Please read my response on this subject titled "Pro-Worker". You'll find it just above your comment. I hope that it further explains my position on this matter. You asked, "what do you know about it?". That's a fair question, thanks. First, I have worked around unions for many years. I have worked in many industries, including the textile, plastics, machines and machine parts, as well as the commercial and residential glass business. I have never worked for a union, but have seen up close and first hand what unions are all about. My working career spanned forty plus years. I have worked in thirteen different states, and in several different industries. I worked off and on for ten years for the U.S.D.A. as a federal-state inspector. I have been in sales, production, management, supervision, and have even swept floors and emptied trash cans. I have done the hiring, and have done the firing. In summary, I've been around the block a few times. I have been a contractor ( business owner ), loan broker, and insurance salesman. As far as your "bigotry" comment, I'll not dignify that with a response. But, I do take exception to your accusation that I "slur" the entire working class. Obviously, you don't know me. I have spoken out for years now, in favor of the hard working citizens of this once great nation. I have preached about the many wrongs meted out to our workforce through no fault of their own. Some nerve you have making a statement like that without knowing anything about me. I have enough common sense to know right from wrong, and what's fair and what's not. The statements and comments that I make have plenty of merit based on facts, actual first hand observations, and the continuing effects reported almost daily by the various news media and organizations. (1) Products made by union workers, as well as products made by non-union workers, can not compete with cheap foreign made imports. (2) Products made by union workers are of no better quality that products made by non-union workers. (4) Unions do not provide job guarantees. (5) Union membership has been in decline. 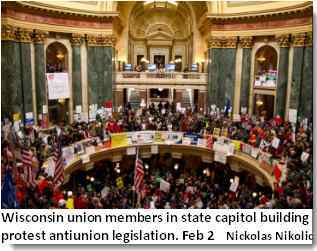 (6) Unions "strong-arm" businesses with threats of work stoppages and employee walk-outs ( strikes ). (7) Non-union workers have the same rights and protection as do union workers. ALL American workers are covered under our labor laws. You asked, "whose side are you on anyway?". I'm on the side of America, the hard working American that's fighting the odds against our anti-America government. I'm on the side of "right" vs wrong. I'm on the side of "justice for all" vs the obvious injustices across the board, especially the injustices against the American worker, imposed by the U.S. government's "selling of America". I'm on the side of "fair play", as opposed to the unfair playing field the U.S. government has placed the American worker on. I'm on the side of the unemployed, standing in long unemployment lines, not knowing whether work will come today, or ever. I'm on the side of those working for low wages due to cheap foreign imports flooding our market place. I'm on the side of our college graduates that can't find work. I'm on the side of taxpayers that see their hard earned tax dollars used to fund bailouts, foreign aid, subsidies to big oil and rich farmers, deadly senseless costly wars, the care and support of illegal immigrants, bribes to North Korea and Iran, looking for water on the surface of Mars, stupid projects such as "The Fence", fat pensions and benefits for members of Congress, wasteful military spending, and pork spending for "favors rendered". If you want to challenge my patriotism, and which side that I'm on, you'll have a lot more than you can handle. I've preached these messages for a long long time my friend. At least I'm not in favor of pricing the American worker right out of a job. You are anti-union and you do not know the history of unions, it's obvious. Now don't fill up the board with this nonsense please. Hey, what nonsense?? Can you prove that anything that I've said is a lie or misinformation? If so, then do it, please. Is this just a one-sided event? Are only those that you're in total agreement with allowed to make comments? I do understand that you obviously have your pets here, but where does fair play come in? And, for your information sir, I know a lot about unions and their history. I just finished reading a piece about the textile unions in the south. Would you like the address to the website? I don't talk just to babble, I know what I'm talking about. Can you dispute what I say with facts and data? If so, do it, please. Otherwise, please allow me the same courtesy that you afford others. It would be greatly appreciated. I've been around unions and union workers all of my life, including family members. I lived in union country next to the chemical and refinery industries in Baton Rouge, Louisiana for ten years. My neighbors were union workers. My friends were union workers. I know a lot more than you think about unions. Serious question : Is this site for pro-union folks ONLY ???? It sure seems that way to me. Aren't there two sides to every issue? Are you only interested in just one side, the side that you're on ??? Do you make a habit of saying that an opposing view and opinion is "nonsense"?? If the view and/or opinion doesn't agree with your thinking, then, to you, it's nonsense? Pleeeese !!! Please point out the nonsense, please. I told you, trolling, being a troll is filling up the comments with argumentative nonsense and I am not going through your absurd claims again. We have over 200 articles on EP on unions, the history of unions. STOP filling up the boards with this trolling crap. With all due respect, please point out the crap. I only presented my side of the discussion, nothing more. Isn't that what everyone else does? If I'm not mistaken, this site is full of opinions and views on many different issues. So, why is mine crap? I offered no lies or misinformation, yet you say it's crap? What crap are you referring to? Are opposing views and opinions crap to you? Please explain. Thanks. I've told you many, many times and I am not interested in repeating myself or filling up this site with misinformation and useless argument. You repeatedly write insults, misinformation, argumentative comments filling up a thread, like you are doing right now. This is troll behavior and you have been given guides as to what troll behavior is. Follow the rules or leave. As much as I don't trust France (I remember 1956 and how they and the Brits secretly risked World War III over Suez), they seem to have more of a First World economy than we do. Their "normal" work week is shorter, they get longer vacations, and medical care. And raising the retirement age to 62 brought on a general strike (take that, Senator Simpson!) Their per capita GDP is $33,300 -- about the same as Germany. Yeah, ours is higher (47K) but distorted more by inequality. Only about 6% below poverty level (ours 15.5% below), and life expectancy is 82 while ours is 78 (must be that red wine in the French diet). About three-quarters of French workers are in service occupations. For over a decade after WWII, about 25% voted communist -- dropped to 19% in 1958 (I guess they were turned off by the Russian tanks in Budapest). What's my point? Oh, I was wondering about how they manage to have decent train service and keep their politicians in line -- something we have yet to learn. Even thought the unions have been shoved down, the general public in France is belligerent when provoked. The nationwide protests during October 2010 showed how direct the French public can be. They do seem to have a more civilized life style and quality of life but the efforts to end that are ongoing. Not too much OT, but the Anglo-French deception of Ike (not a well man at the time) and Foster Dulles (also suffering poor health) was both Stupid and cynical. I've often wondered whether Hungary might have turned out less bloody if the Suez adventure had not been launched at the same time. I remember the oil rationing in Europe, and found Ike's "forgive and forget" response unsatisfactory (you may say "what else could he do?") NSC looked at options (e.g., pull a US division out of Euope, but that might have looked weak). They played us for a chump again and again, and we are still paying for it. Still, I like French rail service (and the hospitality on Air France) and the militancy of their workers over social contract issues. Our workers could use some of their attitude.